My legs are aching today because yesterday I went skiing. Not on a dry ski slope or at an indoor venue, but real skiing on real snow. The venue was Swinhope Moor, just outside the North East boundary of Cumbria off the A687 Alston to Barnard Castle road. We took the direct route via Brough and some “b” roads, but the quickest way is to exit the M6 at the Penrith turn off. After parking the car, we walked the half mile or so to the bottom lift where non-members can pay their £15 for a days skiing, and were soon on our way to the top. Two linked Pommas cover about 850m of ground and allow a decent run back down. There’s a lodge at the top of the first lift which is great for taking a breather and eating your packed lunch, it also marks the start of the bonus run back to the car. 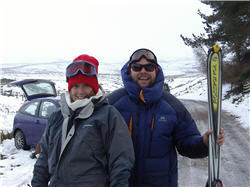 The slopes at Swinhope Moor are run by the Wearsdale Ski Club and are close to another ski area at Yad Moss run by the Carlisle Ski Club.